Receive and send peer-to-peer NFC messages between two phones, or listen to and analyze data sent by other NFC devices! Start the application on two NFC-enabled Symbian phones or the N9 with MeeGo Harmattan. Make sure the connection settings match on both phones. Then, touch the two phones at their back, and keep them close together. Enter a message in the text box at the top of the chat page and press the send button to transmit the message to the other phone via NFC. The NFC chat app uses the standardized LLCP protocol to send messages as well as to listen for incoming messages on a specified address. You can either use connection-less mode (specifying a port) or connection-oriented mode (using a URI). In connection-less mode, all you need to configure is the port to use. If the same port is specified on both phones (default: 35), you’re ready to instantly send datagrams from one phone to the other, as soon as the phones discover each other. This mode is comparable to UDP: connection-less modes doesn’t ensure delivery, but are slightly faster (which might be an advantage for very quick touch transactions, given that NFC is in general not too fast and you will not transfer large amounts of data). In connection-oriented mode, NFC chat allows a flexible configuration of the connection parameters. Most important is the URI, which is by default set to urn:nfc:xsn:nokia.com:nfcchat. Note that the format of the URI is standardized by the NFC Forum – a custom URI has to start with urn:nfc:xsn:, to be followed by your domain name, a colon, and then your application name. Additionally, you can choose whether the phone should act as both a server and a client. In this case, NFC chat establishes two sockets, and you also need to select if the app should send messages through the server- or the client socket. If you only connect one socket – either a server- or a client socket, make sure the configuration on the other phone is inverse; it wouldn’t work to connect two clients to each other. In this case, one phone has to be the server, the other the client. 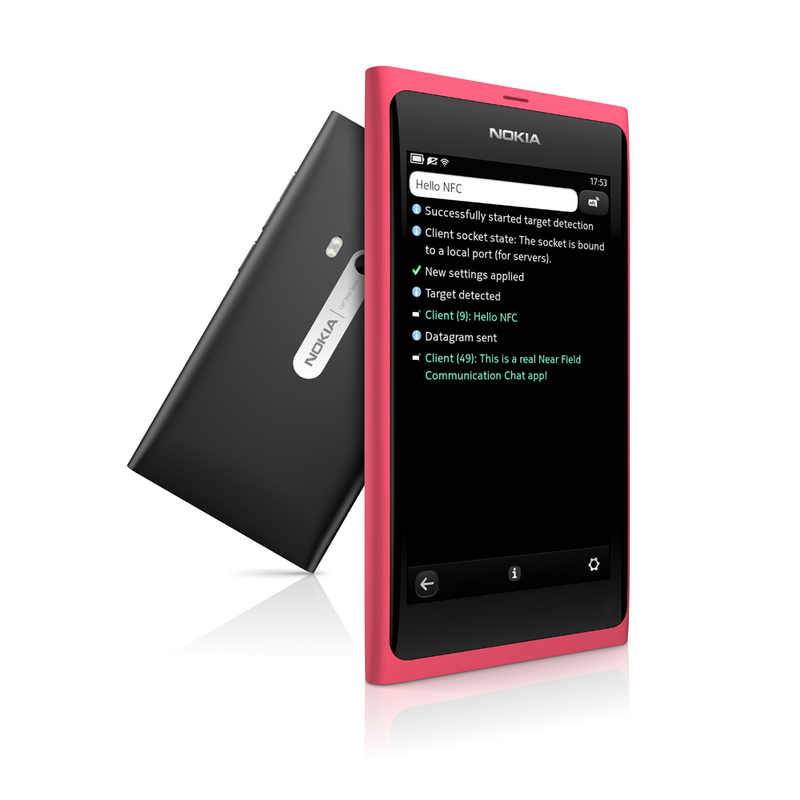 NFC chat is open source and can be downloaded for free from the Nokia Store for Symbian and MeeGo Harmattan. The source code is available on GitHub.